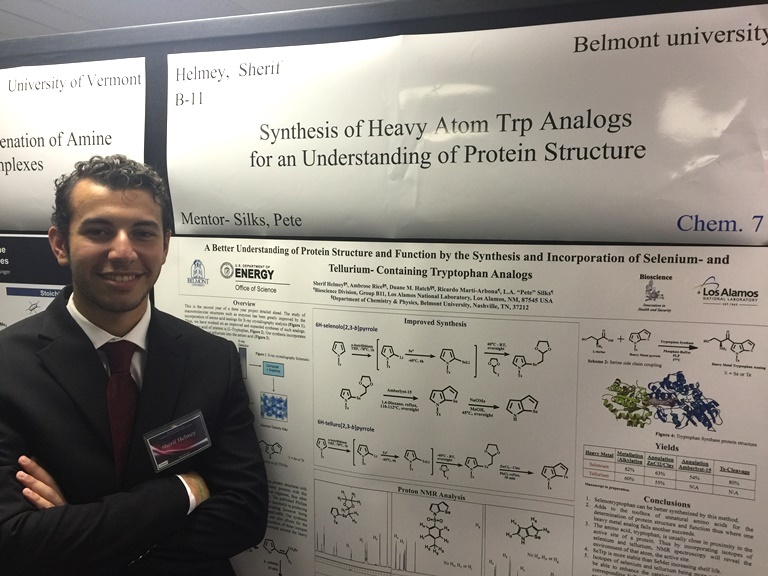 Belmont students from the College of Science and Mathematics presented their summer research at the highly competitive Los Alamos National Laboratory (LANL) Student Research Symposium on August 3. Ambrose Rice, a senior biology major, and Sherif Helmey, a junior biology major, joined more than 200 of the best and brightest undergraduate students from all over the country who have been working all summer on cutting edge research projects at LANL. 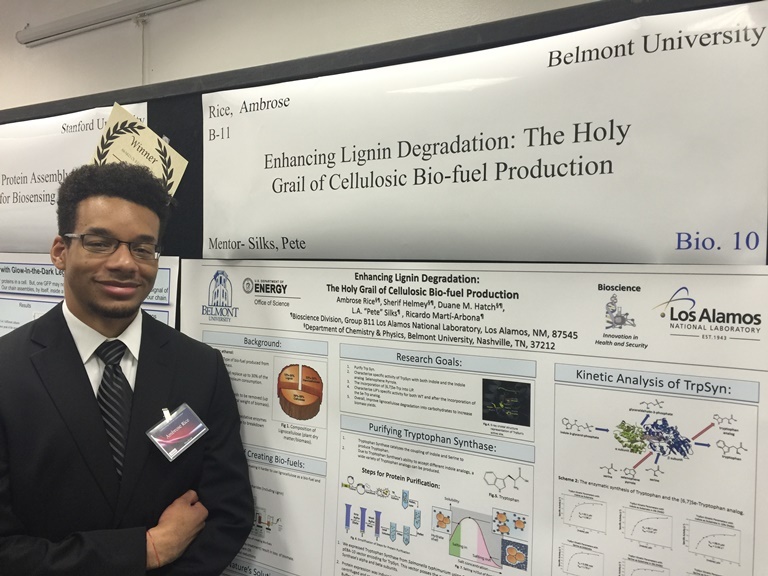 The student symposium is the capstone event for these young researchers after spending 10 weeks at the lab. In its 16th year with a theme of “Celebrating Student Achievement,” students must submit abstracts and put together a scientific poster that is judged by LANL staff scientists and is open to the public. Both students are at LANL as part of a federal Department of Energy (DOE) grant valued at $29,000 that was awarded to Dr. Duane Hatch, assistant professor from the department of chemistry and physics, titled, “Bio-incorporation of a Se-Containing Tryptophan Analog (SeTrp) into Lignin Peroxidase (LiP) to Study the Enhanced Catalytic Ability Towards Lignin Model Compounds and Dyes.” As part of the grant, Dr. Hatch is able to spend the summer at Los Alamos National Lab conducting his proposed research and can select up to two undergraduate students to accompany him, each with a very generous stipend that covers travel, housing and salary for the full 10 weeks. Dr. Hatch serves as the Principal Investigator and LANL staff scientists, Dr. Pete Silks and Dr. Ricardo Marti-Arbona (both from the Bioscience Division, B-11), serve as CO-PIs and mentors to the students.